Protesters at the WDAIL demonstration in Nottingham in April 2014. This year’s World Day for Animals In Laboratories (WDAIL) will take place in Nottingham for the second time in four years. 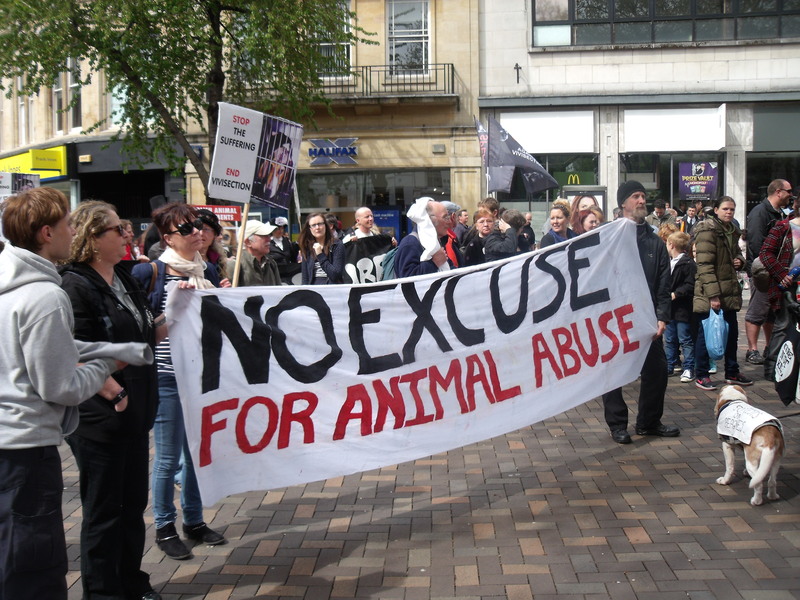 It is being organised by Nottingham Animal Rights, Animal Justice Project and Animal Rights UK. Meet 12 noon at Market Square by Brian Clough statue. There will be speakers, stalls and a march through the city centre. The protest will finish by 5pm. Rats being injected with ecstasy, then subjected to electric foot shocks, warning sounds and water deprivation. Researchers concluded that even small doses of ecstasy can produce negative effects on the rats brain, then broke all the rat’s necks. Hamsters and rats having telemetry devices surgically implanted, then being given amphetamines. Researchers concluded that metabolism of a drug can vary markedly in different species. All the animals were killed. Mice having alcohol mixed into their drinking water. Researchers concluded that chronic low doses of alcohol, induced memory deficits. However, the effects of chronic alcohol consumption in humans are already widely known. All the mice then had their necks broken. The number of numbers killed in animal experiments at universities in the UK is huge and nearly half of the annual total of more than four million. Animal Justice Project contacted 110 universities in 2016 and used the Freedom of Information Act to ask how many animals and what types of animals were used during 2015 and for the universities to share meeting minutes, reports and ethical review body correspondence. Around 10 per cent of universities contacted by Animal Justice Project failed to respond at all. Out of the 90 per cent or so universities that did respond, 61 stated they did carry out animal research – including prestigious universities such as the University of Oxford, University of Cambridge and Cardiff University. Some universities claim not to use animals, but like Manchester Metropolitan University, they may cooperate with universities that do. Information provided by universities which responded revealed 1,750,463, animals were used in 2015 alone. The actual number, however, is likely to be even greater as some universities refused to provide any information. Among them were: Royal Veterinary College, University of Southampton and University of Manchester. Others such as University College London cited fear of “animal rights extremism” in withholding meeting minutes, despite later publishing figures of animals used on their websites. Just after the 2014 march in Nottingham, I made one of the first entries on this blog. That day I went from London on a coach which with about 30 other activists. There were about 500 people on the march, which was about average for that period, although in the past couple of years numbers have declined quite dramatically. Only about 200 turned out for last year’s protest in Birmingham. I did add, however: “Nevertheless I don’t regret the trip to Nottingham. I discussed it with a friend and we concluded even a relatively small and muted affair is preferable to nothing at all. As long as there is a flame of dissent – no matter how small and flickering – there is always the chance it can grow. The future is unwritten!” I will once again be at WDAIL in Nottingham.